The Casa de Campo (Country House Park, in English) is the largest park situated west of central City, in Moncloa-Aravaca district. It was formerly a royal hunting estate. It's area is more than 1,722 hectares with a lake than has nearly 80,000 square meters of area. It is common for families from Madrid to spend days in the park, enjoying the nice weather and looking at the wildlife that may be seen around (squirrels, rabbits and different birds). During the weekends, many families come to the park for a picnic. There are picnic tables. The mediterranean flora and variety of fauna add to the pleasant atmosphere of the park. And in the summer it becomes a rock concert venue. 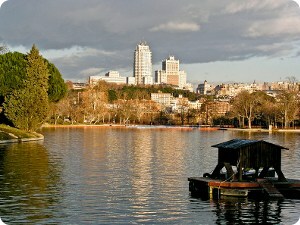 An Amusement Park ("Parque de Atraciones de Madrid") and the city’s Zoo ("Zoo Aquarium de Madrid") are located inside the park. The Amusement Park has exciting attractions for all ages, including pony rides, a maze, a carousel, roller coasters. In the Zoo you'll find close to 3,000 animals from all continents, as well as a large Aquarium and a dolphin tank. Also it includes a large lake, and the Aerial Cable Car ("Teleférico") also ends here in its journey from Paseo del Pintor Rosales (in the West Park on the other side of Manzanares River). The Madrid Arena. It's a multi-service building and many other popular sports facilities. Venta de Batán. It's a traditional place to hold bulls during the days before the bullfights at the Las Ventas Bullring. It is open to the public every day of the year. * Line 5 - Casa de Campo station. * Line 10 - Lago, Casa de Campo or Batán stations.